Let the Turks have their shish kebab and Indonesians their sate. I raise my fork for churrasco (pronounced shoe-HRA-skoo), Brazil’s spit-roasted version of barbecue. So when a young Memphis, Tennessee entrepreneur, Blake Carson, offered to send one of his rodizio grills to Barbecue University, I couldn’t say yes fast enough. Eyes popped and jaws dropped when students realized they could reproduce the Brazilian steakhouse experience in their own backyards. Blake has designed a new version of his astonishingly cool grill, one that adapts to some of the most popular gas and charcoal grills in America. He’s launched a Kickstarter crowdfunding campaign to raise capital and I know we’ll all want to support him. When I was 14 years old, I moved to Brazil for a summer to play soccer. Awesome stuff for an American teenager, but it was nothing compared to a life-changing discovery I made in Rio de Janeiro: churrasco. It was during the ’98 World Cup, and the thing that struck me the most was how Brazilians love their barbecue as much as their soccer. I quickly understood why: because it’s AWESOME! Not just the barbecue itself, but the entire bonding experience that surrounds it. The only way I can explain is by likening the experience to being at a barbecue rock concert of skewered deliciousness, circulating around the party while eagerly anticipating the next flavor. And there you have it. What I now consider my life’s calling: I went to South America for soccer and came back with an entirely different purpose, which was to bring Brazilian-style rotisserie grilling to Memphis and ultimately, the rest of the world. Not everyone was receptive to the gospel I was trying to preach. “What? Grilling with an open flame over wood or lump coal? How does it cook without a lid?” Hell, I was 14 looking for investment dollars for a Brazilian barbecue business and I hadn’t learned to drive yet! A Carson Rodizio on a Weber kettle grill. The mission nearly ate me alive. 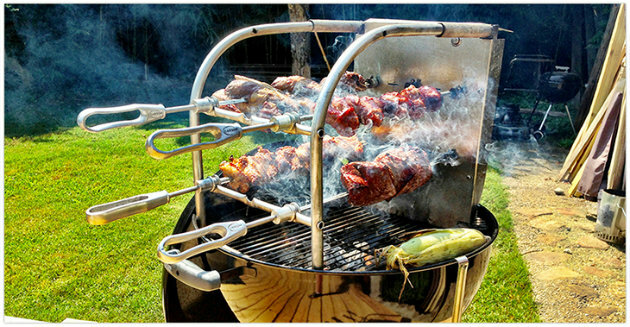 What kind of product, tool, or other device could introduce Brazilian barbecue to a culture that already loves barbecue (i.e. the world) the same way Starbucks appealed to cultures that already loved coffee? The creative trip began to develop a prototype. I sped to my neighborhood Home Depot, invested what little money I had to my name in some cheap conduit, and built the first conversion kit in my garage. If you like what you see, we would be so honored to have you help us in making this dream a reality.